Rajeev's World: Heaven On Earth! If I talk of food, there is always one city in this country that I absolutely adore. That city is Calcutta - I prefer this way of calling the city to the politically inspired Kolkata. Whatever way one reaches the city of Calcutta (or Kolkata, as it is called now), by air or by train, the two things that hit you are the stench and the sweaty humidity that is ever present. And after one makes through a cacophony of "Ami", "Cholbe? ", "Hobe Na! ", "Tumi" to taxi stand, the grime and filth of the rickety yellow taxis of the city hits next, real hard. "God! Where have I reached?" 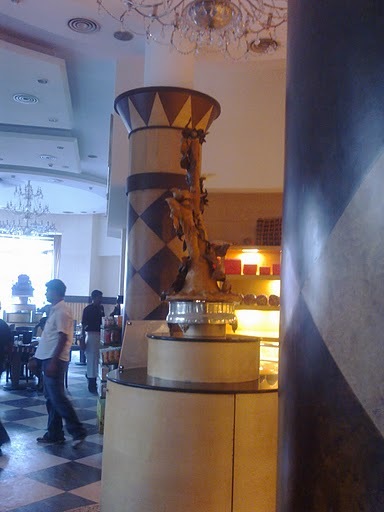 But if you are sure that life always has good things in store for you after the bad, then Calcutta does not disappoint at all, especially with all its gastronomical delights. I had the good fortune of visiting Calcutta on four occasions, of which two were for weddings. Truly there isn't a better way of exploring the authentic delights that a region has to offer than to visit a wedding. The weddings I attended in Calcutta were for extended periods of time, covering pre and post marriage celebrations and that was a real, real treat. It was a real revelation that no matter how innocuous or bland the Bengali treats look, they can be real fiery! As a perfect carnivore, I fell for the various fish starters on offer - the fried hilsa, and rohu swept me off my feet, like no Bengali belle ever could. The mild-sweetness of the fish was complemented by the intense sharpness of mustard! The dishes that followed were matched to perfection - machher jhol, shukto, aloo-poshtos along with other bhajas, etc. To end it all, rossogollas and sondesh, and yes you cannot help it, a few loud belches too! But Bengali delights are not the only treats Calcutta has on offer for the foodie. 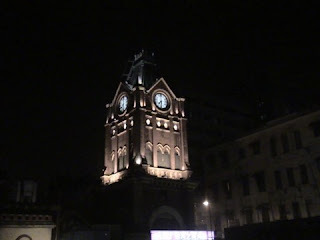 In the yesteryears the city of Calcutta was a true melting pot. The British had made the city their capital, the administrative capital of India. The city beckoned wealth with its trade in jute, muslin, cotton and other commodities. And with this wealth, the city assumed the status of a coveted port city, which brought the city a good deal of migrants. The Armenians, made the city their home. The Baghdadi Jews came in, after persecution back home. Impoverished Chinese in came after battling famine at home. Parsis and Marwaris came to the city when the Opium Trade flourished in the 1800s. With these new cultures came in diverse cuisines, remnants of which can still be found in the once glamorous city of Calcutta. As you walk past the heritage structures of Park Street, one can only wonder, in sadness how rapidly the grandeur can evaporate. 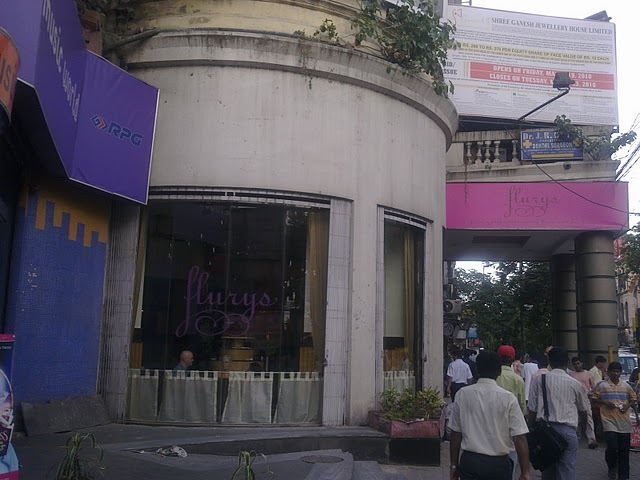 But places like Flury's and Moulin Rouge still stand firm as vestiges of the bygone era. These were popularised in the Bollywood movie, Parineeta! Flury's still carries with the amazing charm of English delights and a wondrous variety of teas. My first meal at the Flury's was a tuna sandwich with a cup of golden nectar, Darjeeling tea. Now that is an absolute heaven on earth on a cool, relaxed Calcuttan winter morning. Flury's charm floored me completely, or rather absolutely. On same trip, we took out an hour to have dinner at Flury's. I ordered a grilled breast of chicken with salads and mashed potatoes. The subtle salads went well with the smokiness of the chicken, but the live jazz performance was amazingly out of this world. But the next morning, rather early, was the flight back to Bombay. I had to promise myself that I be back at Flury's for more, more food and more music to feed my soul. And I hope Flury's lives on, at least till the time I get back to Calcutta again. The Chinese who came to Calcutta, made the city their home and gave India its first and only Chinatown at Tangra. They blended their flavours with the Indian ones to concoct a wondrous of Indian version of Chinese. I recall pigging out at a fancy Chinese place (I cannot recollect the name now) on Park Street - that was an amazing meal with a steaming, subtly flavoured fried rice, having just about a hint of flavour with peppery chicken gravy. But then there is more to explore in the city. I first read about this place in the early 2000s, in an online article on the Jewish heritage of India. Nahoum's, a bakery located inside the crumbling heritage structure (with the clock tower), on Lindsay Street, New Market, was founded by an immigrant Baghdadi Jews, Nahoum Israel Mordecai, in 1902. The bakery offered an array of Middle Eastern pastries, like the Backlava and unleavened breads that the Jews have on Sabbath. But those days, the city was far more cosmopolitan than we can imagine today. Nahoum's diversified its menu to include English pastries and savouries as well. But things change, eras end. Change came to Nahoum's too - I am told that the bakery has been sold to a Bengali sometime back. My visit to Nahoum's was a pilgrimage of sorts to the Mecca of desserts and I had to, I just had to buy Backlava. 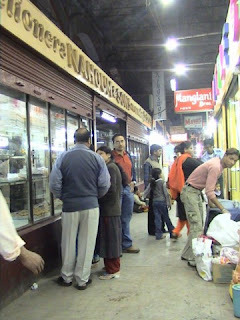 Our trip to Calcutta was not complete without a visit to the KC Das outlet at the Esplanade. The chain was founded by Krishna Chandra Das, in the 1930s. Krishna Chandra Das's father, Nobin Chandra Das got into the business in 1866 and is said to have concocted rossogollas and sondesh, that are much enjoyed till this date. That is certainly not surprising considering the Bengalis' addiction for all things sweet, pun intended! On the streetfood front, while the Bengali versions of chaats, particularly their versions of gol-gappas, which are called puchkas are nothing much to talk about. But the kathi rolls are simply out of the world. Made with parathas, coated with egg and wrapped around juicy chunks of chicken, fish or vegetable kebabs, and sprinkled liberally with chopped onions, green chillies, spices and mint-coriander chutneys, this spicy concoction, is essentially a quick bite on the go, an essential comfort food infinitely delighting the tastebuds. Living in Bombay, I am fortunate to enjoy this spicy treat at the Hangla's Lokhandwala every few weeks, and that takes me back instantly to the treats that Calcutta has on offer. For Bengalis and Calcuttans in particular, food is not sustenance, it is a pleasure, to be enjoyed, to be savoured, every moment of one's life. Truly, in a sense, when it comes to food, Calcutta is the Paris of India. In all, Calcutta is certainly the place I would never like to live in, if I could, and did have a choice, I would have every meal of my life, from now on, in Calcutta! For the epicure, Calcutta is indeed, Heaven on Earth! & yes its a Heaven On Earth!